How do you build a successful startup? Where do you get your ideas from? How do you find out if a startup works or not? How do you stay motivated after working on a startup for several months? These were just some of the questions which people asked me via Facebook, Twitter, email or the comments section after my last startup Meet-a-Mom. I would like to answer these question with one of my existing startups: Consulting-Cases. 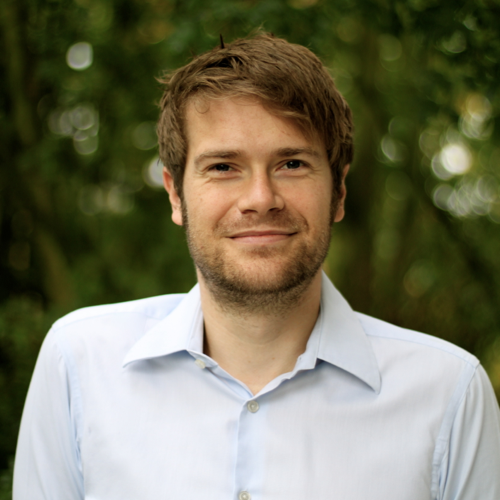 This week I have to work hard on my existing startup Consulting-Cases, because one of the biggest German news website (www.spiegel.de) wants to promote it (hooooray!). These are great news for my existing business 8seeds, but unfortunately bad news for The Weekly Startup, because I don’t have enough time to launch a new startup this week. But I didn’t want to break my chain of writing about one startup each week. Therefore I decided to make a virtue out of necessity and write about one of my successful, existing startups to give you some valuable insights. Guess which one? Right: Consulting-Cases. Writing about a successfully implemented startup has one major advantage: I can show you in this blog post proven strategies, that can help you to build your own business. By doing this I can hopefully answer some of the questions you asked me during the last 3 weeks. Speaking of which, please do not hesitate to send me your questions directly via email. Numbers first: Consulting-Cases is making approx. 1.000 Dollars per month and we invested around 4 weeks of work into creating it. The only costs we have are the payment solution and the hosted server, therefore Consulting-Cases is a very nice source for passive income for us. Using the example of Consulting-Cases I want to show you my process of building a successful startup. Of course there is not „the one and only“ process to launch a startup (if there were, all of us would now be sitting on the beach, drinking a nice Piña Colada), but at least I can show you my/ one way to build a working business. 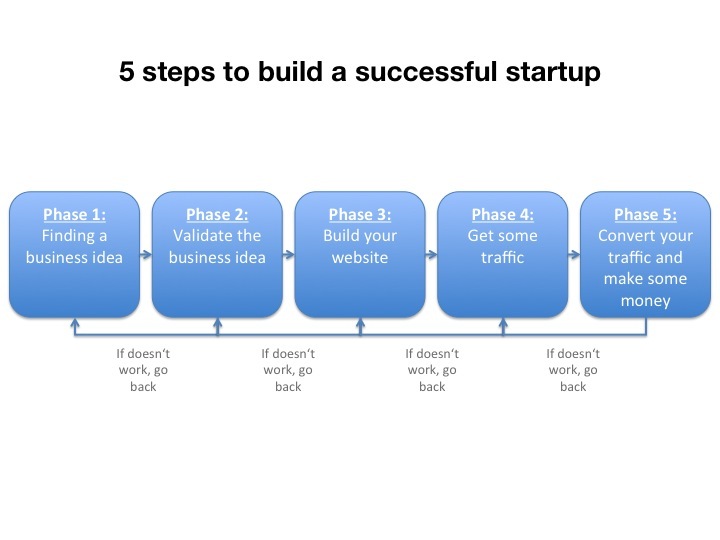 One last thing – just following this process doesn’t guarantee your startup will be successful. Of course you need some luck, too. But I think it will at least help. Enough said: Let’s get down to business. Okay, to give you an overview I decided to divide my startup process into 5 high-level steps. One could describe the process in much more detail, but I decided to keep it as simple as possible and get more into the details within the different steps (because Consulting-Cases is an online business, I focus on online businesses in this blog post). What’s the idea of Consulting-Cases? We sell preparatory documents for job interviews at consulting firms like McKinsey, Boston Consulting Group and so on. When you have a job interview at a consulting firm they typically give you a business case which you have to solve, something like „Your client wants to sell more frozen pizza in Alaska. What’s your advice?“ At Consulting-Cases we sell 9 cases at a price of 6 Dollars. You can download these cases directly from our website. No rocket science, but actually a business model that works quite well. So, how did we find this idea? Well, we looked for an existing market with a working business idea and just copied it. When I am looking for business ideas I use the following chart very often. Looks boring, but it is actually quite useful. So what are the fields I – IV all about? Field I (Existing Market/ Existing Business Idea): This field is for business ideas (= sell preparatory documents for job interviews) which people (= applicants at consulting firms) are already willing to pay for (= existing market). That’s great news, because if you can make your product just a little bit cheaper or better than the existing product you will probably find customers very quickly. And this is what we did at Consulting-Cases: When we started the business there was only one book with cases for job interviews on the market, which was sold for 40 Dollars. We decided to sell our product solely online and for just 10% of the price (we could raise the price later) – and it worked. Field II (New Market/ Existing Business Idea): This concept also works very well. Just look out for business ideas that work well in other countries and copy the business for your own country. There are thousands of startups that made a lot of money by following this concept. Field III (Existing Market/ New Business Idea): In this field, you take an existing market and try to find new business ideas. Building a startup here is a little bit harder than in the two fields before, because you have to convince the market of your new business idea. And this is generally a lot of work. We tried this for Consulting-Cases by offering one-on-one coaching sessions, but it didn’t work. Field IV (New Market/ New Business Idea): This is were most entrepreneurs want to go, but where it’s the hardest to make some money. The chance that your startup will succeed in this field are veeeeery low, but if it succeeds you will probably earn a fortune. Why is it so hard to make money in this field? Because you have to find a new business idea, convince a market of it AND create this market. This is really, really tough. The good thing at Consulting-Cases was that we didn’t need to validate the business idea, because we knew, that it was working: people were already buying books with business cases. If we could offer better cases at a cheaper price, we would make money. That’s the great thing when aiming for Field I (Existing market/ Existing Business Idea): In most cases you don’t have to validate your business idea. But what if you have to validate? Then set yourself clear goals and don’t take more than a week to validate your business. For example, try to make at least 10 Dollars revenue in the first week. If you don’t make it or don’t even get close to it, then stop your business after the first week. Once again: Stop it! I have done this mistake too often: Working weeks and weeks on a startup without making any money. It’s not worth it. It’s better to stop the business and look for another one. It’s not hard to build a website. Install WordPress, buy a nice theme on Themeforest – that’s it. It took us 5 days to build the Consulting-Cases website (it took so long because we didn’t use WordPress for it). It won’t win the website-beauty-contest, but it works and that’s what is important. How did we build the Consulting-Cases website and what was important important for us? You probably know that it’s important to use the right keywords to get a good ranking on Google. But how do you find the right keywords? Again: We copied our competitor. 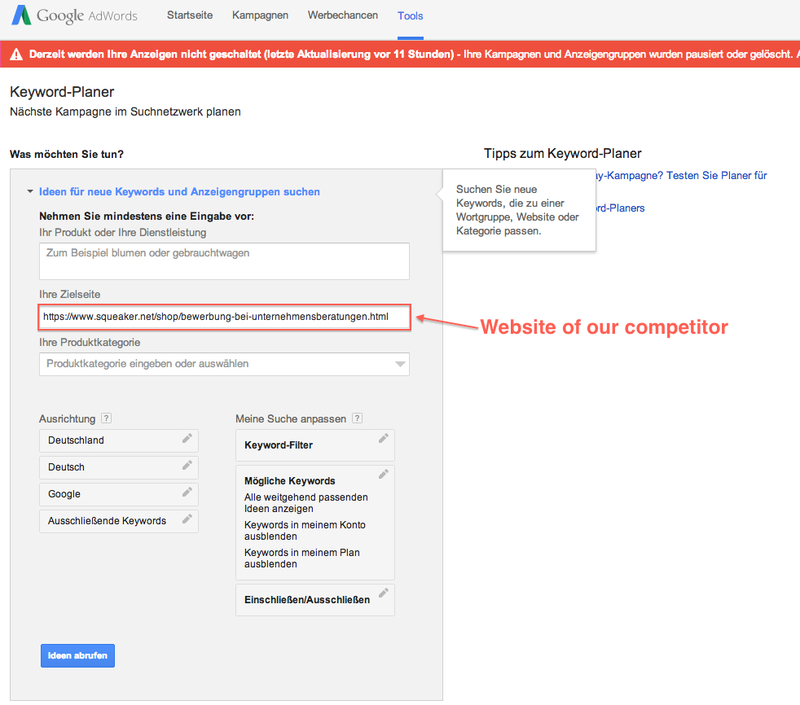 We looked at the website of our competitor (who is selling the business cases book) and simply put the website into Google Keyword-Planner. 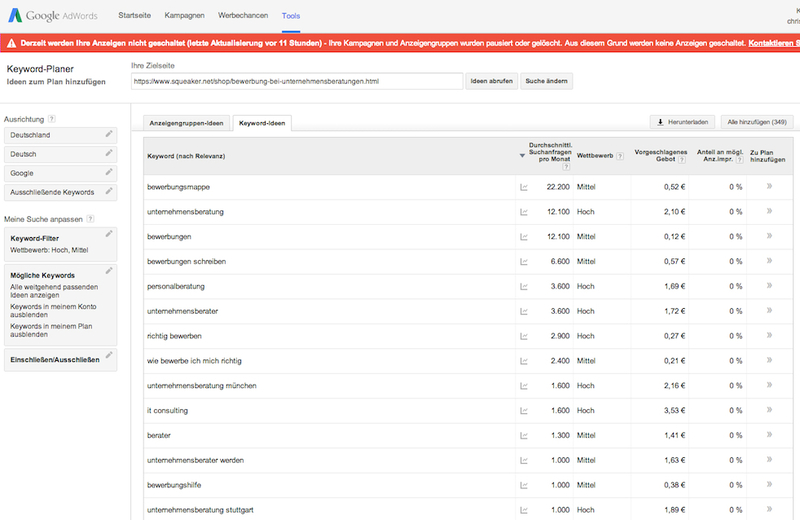 Finally, we filtered the results for keywords with high and medium competition (because this is where people buy AdWords – therefore there must be some money in this market) and used the most promising keywords on our website. Where did we use the keywords? 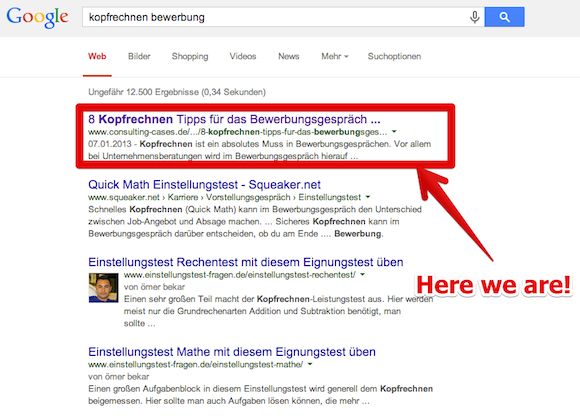 We used them in the meta description, the headings, the URL and the alt-text of the images. We just followed the Google SEO Starter Guide as well as possible. It is still a good reference to start out with learning basic SEO. When people visit your website they must understand within seconds what it is that you are offering and why it is useful for them. We put our „this is what you get“ section at the top of the website and tried to keep it as short as possible. We even used bullet points (or even better: green tick marks) to make it easier to read. It is very important to put this text at the top of the website. 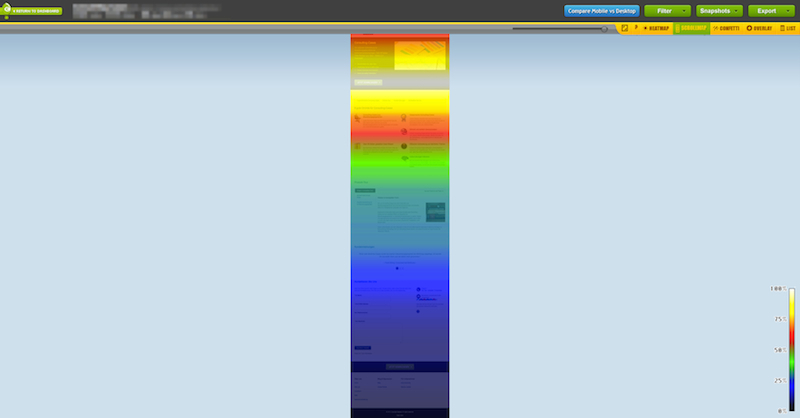 When you look at our scrollmap you will understand why (blue = no one is looking at it; white + yellow = a lot of people are looking at it). Most people who visit your website won’t scroll down. Therefore they must see your offer at the instant they open the website. That’s the reason why you typically put the red “Sale” sign in your shop window and not in your fitting room. Try to make it as simple as possible to buy for people visiting your website. 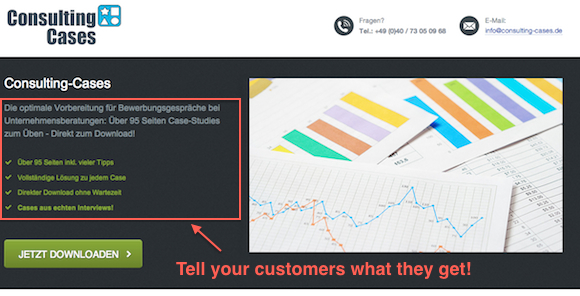 Use a BIG button with a simple call-to-action. Put the button at the top of your website. Additionally we put our „Buy it now“ button at the bottom of the website and at the top when you scroll down the page, so the customer doesn’t have to search for it. People won’t buy from you if they don’t believe you. Therefore, give them reasons to believe. That’s why we put some testimonials on our websites. We got these testimonials by giving away the product for free in exchange for some feedback. It actually worked quite well. 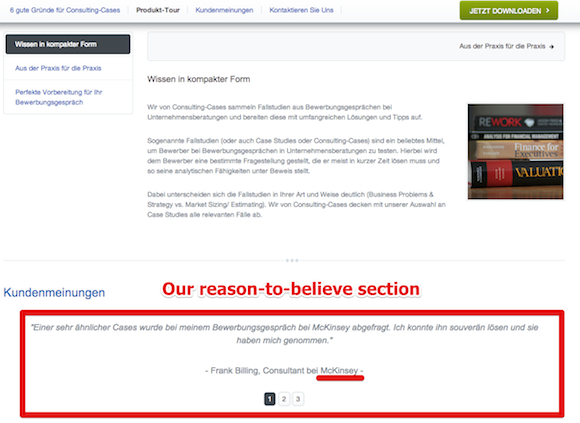 Another good way to give your customers a reason to believe is the „About us“ section. Tell your customers your story and tell them why they can trust you. We finished our website, did all the SEO stuff, launched it – and guess what: No one visited (except our parents). 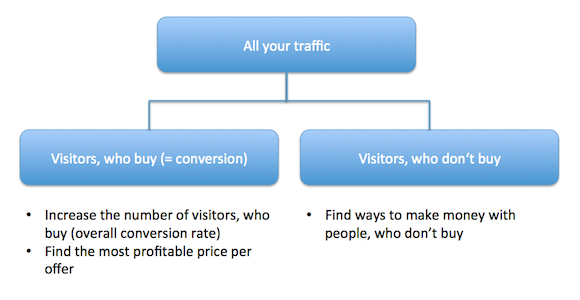 This is probably the question I hear the most: How do you get traffic to your site? 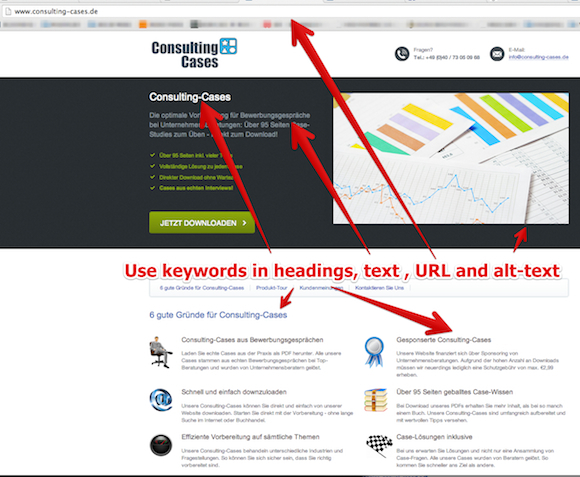 At Consulting-Cases we started with AdWords, but it didn’t work very well. Then we tried to build a Facebook Group and tried to bring the traffic to our website – didn’t work either. What really worked for us was starting a blog, focussing on keywords with high traffic and waiting. Writing a blog has a very big advantage: You can easily add more content to your website without having to change the existing one. By adding new content you can attract new visitors. For Consulting-Cases, this worked extremely well: 80% of our traffic is coming to our website via our blog. When we write a blog post we try to write about keywords with a high search volume within our niche. For example we wrote blog articles about „Letter of Application for Consulting Firms“ and „8 Tips for Mental Math in Job Interviews“. We posted these blog posts into every forum and social media site we could find. And it was worth it: For the keywords „letter of application consulting“ and „mental math job interview“ we rank at the top Google position – and this brings us a lot of traffic. But it really took some time and a lot of blog posts to get such a good ranking and the amount of organic traffic we needed (approx. 6 – 8 months). You have to be patient if you want to make money with organic traffic. Buy AdWords: Probably the most common way to get traffic to your website. In many cases AdWords work very well. Look out for long-tail keywords, which are cheap and very specific. Buy Facebook-Ads: Buy Facebook-Ads and bring the traffic to your website. The big advantage of Facebook is that you can target your customers very well. Find the fitting Reddit-Group and buy ads on Reddit: Reddit ads are relatively cheap and you can target your audience very well. It worked for me several times. Post in forums: Find the right forum for your business and post your offer in it. Also a great way to get some feedback on your product. You probably know this kind of conversion stories: „After I changed my ‚Buy it‘ button from blue to green, my conversion rate went up about 10%“. You know what: Forget about it. This kind of optimization is useful when you get 100.000 visits per day on your website, but not when you just started out. And do you know why big companies focus on this kind of optimization? Because they have already tried all the other things that brought them an even higher increase in conversion. 10% increase in conversion for a startup is way too low: You should aim for at least 100% – you easily have the potential in the beginning. When you just get a few hundred visits per day you should make the most out of it. Therefore we tried to increase the overall conversion rate and offered different products for different prices. Our idea was that if someone doesn’t want to buy 9 cases for 6 dollars he or she would like to buy 3 cases for 3.5 Dollars. When we found the right products we started to experiment with pricing. We raised the price step by step to find the price with the highest profit (this price is usually not the price with the best conversion rate). At the same time we tried different tactics to make some money with the people who didn’t buy our product: We sold advertising space on our website and tried some remarketing tactics, to sell them our existing product or a different product later. It’s an experiment that never stops. At the moment we offer just one product for one price and don’t sell any advertising space – and this works quite well for us. Most of the times the simplest way is the best way. Just one last side note: It’s important to get the first conversions relatively fast to build momentum and keep your motivation high. Nothing is more frustrating than having no sales. Therefore I would recommend to start with a smaller price that you can raise later. Make the most out of your traffic – anytime! All right, that’s how we build Consulting-Cases. I hope you could get some useful information out of it. Next week I will start a new startup again and tell you about my lessons learned. Sign up for my newsletter to get the post directly delivered to your inbox. Feel free to comment on Consulting-Cases. Love to get your opinion about it. P.S. : Many thanks to Ilhan Garou, who proofread this article – great guy! Great in-depth post, Chris! 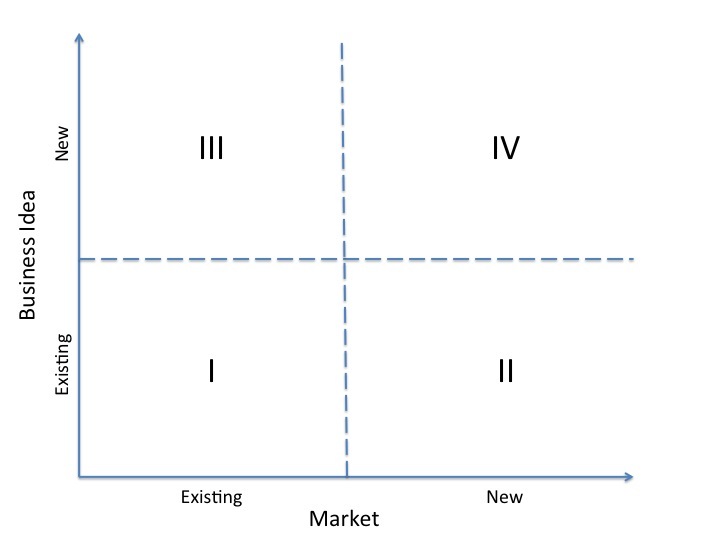 I especially liked the business-idea/market matrix… I never looked at it like this before. And congrats on being featured on “der Spiegel”! Hi Chris, I’m really enjoying your posts, especially the refreshingly pragmatic approach and go-for-it attitude. Although my business is old-fashioned and offline I am also picking up loads of tips! Good luck to you! “P.S. : Many thanks to Ilhan Garou, how proofread this article – great guy!” – Obviously he forgot this sentence, as it must be “who proofread this article”. *lol* My fault. Thanks! I will change this in a second! Thanks for your articles Chris, these are great. I have a question on the Case Studies startup. Without me trying to be invasive on your methods, how do you get the cases? If you buy some books and then resell a selection of those cases, isn’t that a violation of registered rights or intellectual property?